Prof. Drs. Koentjoro, MBSc., Ph.D., has been elected Chair of UGM Board of Professors for the period of 2018 - 2021. Meanwhile, Prof. Dr. R.M. Gunawan Sumodiningrat, M.Ec has been elected Secretary. They were both elected in a plenary meeting on 28 July 2018 to succeed Prof. Dr. Ir. Putu Sudira, M.Sc, who has gone on retirement starting July 2018. UGM Vice-Rector for Education, Learning, and Student Affairs, Prof. Dr. Ir. Djagal Wiseso Marseno, M.Agr, hoped the new chairman and secretary would carry the Board of Professors as the big house of UGM that produces ideas and views that can inspire university executives. 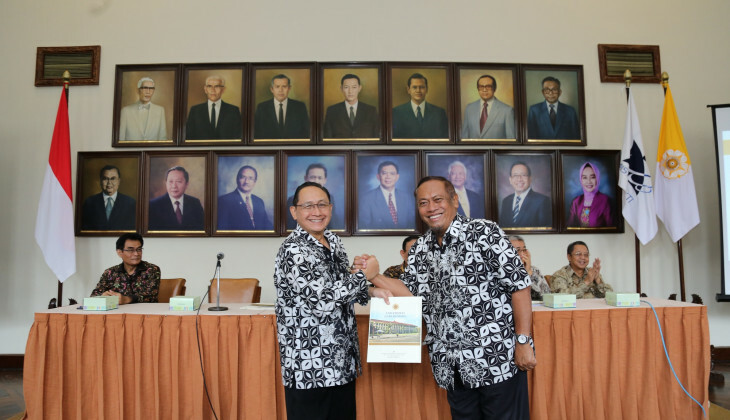 "In line with the job description of the Board, one of the jobs is to give input towards UGM and strategic ideas for national level,” he said on Friday (10/8) in Senate Hall after the handover ceremony. Djagal said the job descriptions include organising national forums or meetings of which the results will be submitted to the state. "I think that is very good and needs to be passed on to the new leadership so UGM can give contribution to the state,” he said. Prof. Dr. Ir. Putu Sudira, M.Sc said the duties of the Board were already stipulated in the statute and were expected to be carried out well. "Those can be seen in the organising of meetings on university identity. Those are expected to continue as UGM has a role as a university that fights for independence,” he said. Similarly, Prof. Drs. Koentjoro, MBSc., Ph.D, said the new leadership would follow up the programme that had been started by the previous one. "In August we will run a workshop on human resource planning of UGM professors. On 31 August 2018 we plan to hold a plenary meeting that will bring together new and retiring professors,” he said. Later, a Forum of Indonesian Professors will follow and invite former military chief of staff, Gen. (ret) Moeldoko, and in October 2018 Youth’s Oath. "So to be a pioneer has to be in the forefront, but also in the back, developing and instilling nationality and Gadjah Mada values as well as presenting views on knowledge development,” he said.